We just had two days off, yet I didn't write a single word about the tour in our downtime. Instead, it's back to the iPhone notes while sitting in the back of the van. Good to know I maintained my stellar work ethic from the school year. From the moment the appetizer was placed on the table, the loftiness of The Hightower’s name made sense. 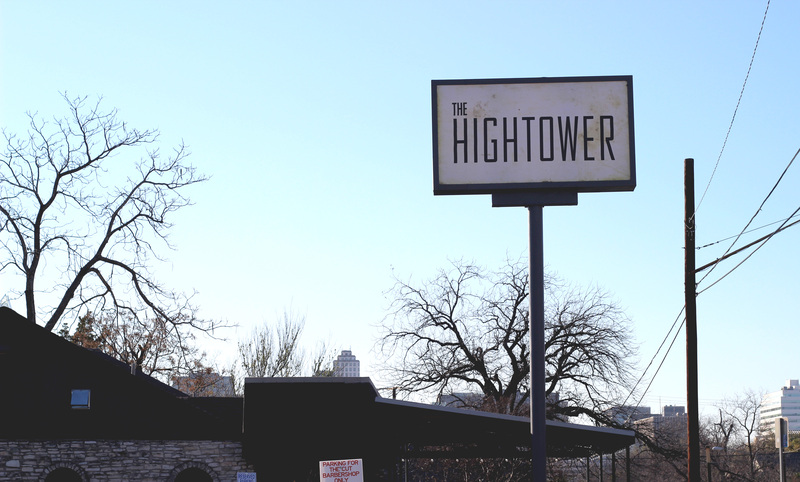 While the menu uses some very common ingredients, The Hightower combines and elevates them to a high art form. The restaurant itself appears to be a repurposed house. Although in a rather secluded area on East Seventh Street, it feels homey and residential in comparison to the bustling downtown area of Sixth Street across from I-35. Presentation is clearly a priority at The Hightower. 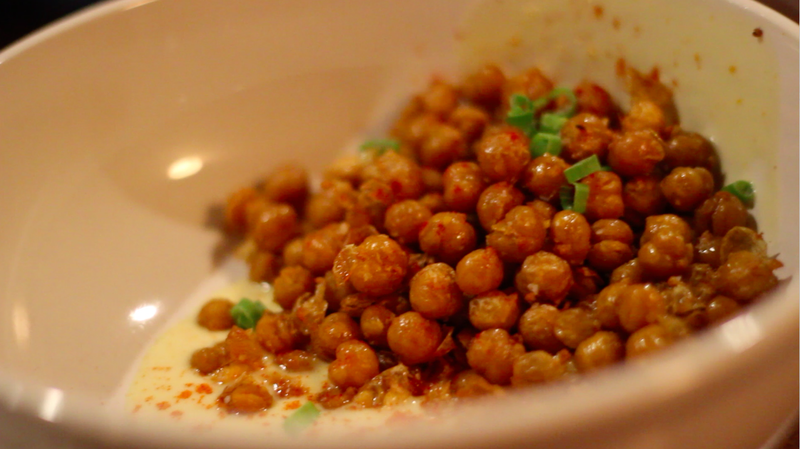 For the appetizer, I ordered chickpeas with marsala, orange aioli and green onions. The dish arrived in a huge, white bowl, with the chickpeas distinctly separate from the marsala and the aioli arranged artfully on top. It was an unexpected surprise to see legumes as the centerpiece of a dish. To be honest, chickpeas are not what I traditionally expect for appetizers at a nice restaurant, especially since I use chickpeas, also known as garbanzo beans, as a topping on a garden salad. Their chickpeas were lightly fried, giving them a slightly crispy outer shell and a soft inner core. Combined with the creamy marsala and the subtle tang of the aioli, one bite seemed to combine every sort of texture. The taste was pleasant, but not delicious, nor particularly filling. I guess it fulfilled the purpose of an appetizer — it satiated my hunger temporarily and left me wanting more in anticipation of the entrée. While the most expensive entrée on The Hightower’s limited menu is the poached salmon, priced at $18, their blistered green beans are also offered as an entrée for $8. 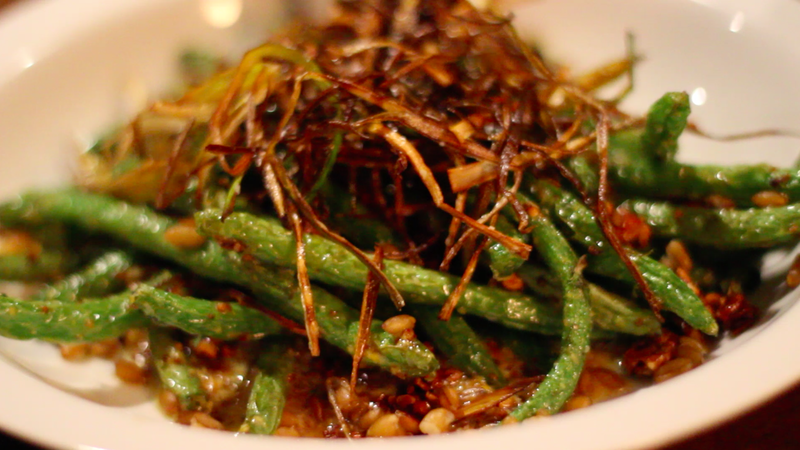 The green beans were prepared with an array of other ingredients: faro, honey mustard, candied pecans, leek and mint. Again, thought in presentation was evident from the calculated arrangement of the dried leek on the enormous pile of green beans. A few bites at most are all you should eat of this dish, not because it doesn’t taste good, but because it is so flavorful and tangy — in a way that heats the back of your tongue. The seasoning overwhelms the natural taste of the green beans. However, the carnitas were the highlight of my meal at The Hightower. Savory and filling, the crispy pork was served with a delicious beer and cheese soup made with Austin Beerworks' Black Thunder beer, grits, cabbage, radishes and pickled mustard greens. It just melted in my mouth (cliché, but true). The dish was a great combination of ingredients, with subtle flavors, such as the grits, and ingredients with distinctive flavors, such as the carnitas and pickled mustard greens. The beer cheese soup serves as a great base for the dish, too, and was particularly nice to have on a chilly night. Although the food intrigues the taste buds with the first few bites, the portion sizes are so large that the flavors become rather monotonous and a little tiresome after the twentieth bite. Rather than ordering individual entrees, I recommend ordering a few dishes and asking for separate plates, so you will be able to sample some of the truly unique flavors in each dish without becoming overwhelmed by a mountain of green beans.